Inkscape is a two-dimensional drawing program. It can, however, be used to create simple three-dimensional drawings. We will create in this tutorial a simple Isometric Projection. 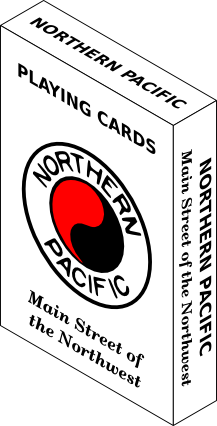 A box of playing cards. An isometric projection is a view of an object such that there is an equal opening angle between the three projected orthogonal axes, as shown below. 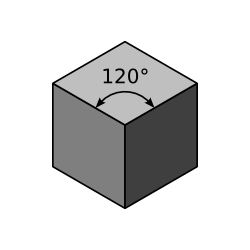 The isometric projection of a cube. The angle between each pair of projected axes is 120°. Inkscape includes axonometric Grids that can be used to rapidly draw isometrically projected boxes. However, the method described here works best when drawings are included on the sides of the boxes as distorting the sides requires two precise transformations (scaling and skewing). Create the three sides of the box, unfolded. Add designs to box sides. Transform each box side into place. Follow the instructions for setting the page size and defining a Grid given in the Swedish flag example but set drawing size to a width of 500 pixels and a height of 500 pixels. Set the Grid spacing to 10 pixels. In the Snap Bar, enable snapping ( ), enable snapping to the Grid ( ), and turn off snapping of bounding boxes ( ). Create the three sides of the box. 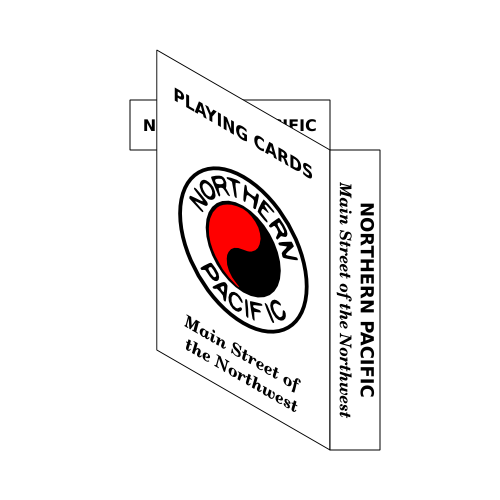 We need the front, side, and top of the box in the ratio 6:4:1, similar to the dimensions for a deck of cards. Create one rectangle with a width of 200 pixels and height of 300 pixels with the lower edge 100 pixels from the bottom of the page. Create a rectangle to the right of the first with width of 50 pixels and height of 300. 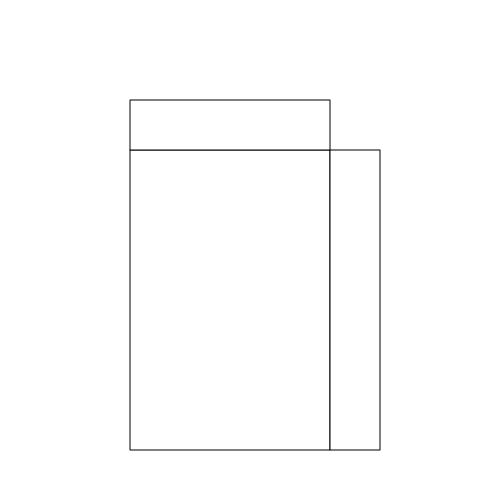 Create another rectangle above the first rectangle with width of 200 pixels and a height of 50 pixels. The paths of the rectangles should overlap. Turn on the Fill of the rectangles with the Palette or Fill and Stroke dialog (Object → Fill and Stroke... (Shift+Ctrl+F)) and set the Fill to white. Turn on the Stroke and set the Stroke color to black and the width to one pixel. Set the Stroke Join to Round by clicking on the icon under the Stroke style tab in the Fill and Stroke dialog. This will make the corners where the rectangles touch neater. The sides of the box laid out flat. Add designs to the box sides. You can add any designs you want to the box sides. 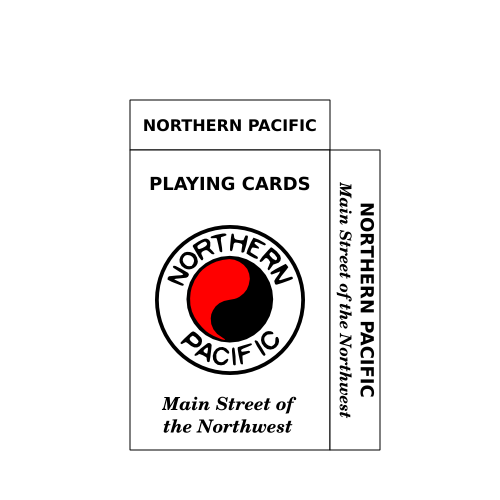 I will use the NP logo created in the previous tutorial as well as some text. Import the logo using the File → Import... (Ctrl+I) command. The logo will need to be scaled smaller. You can do this by click-dragging on one of its corners. Hold the Ctrl key down to keep the height to width ratio constant. Once you have it sized appropriately, you can center the logo within the large rectangle by using the Object → Align and Distribute... (Shift+Ctrl+A) dialog. To add the large rectangle to the logo selection, click on it while holding down the Shift key. In the Align and Distribute dialog, select from the Relative to drop-down menu Last selected. Since the rectangle was the last object selected, it will remain fixed and the logo will move. Click on the Center on vertical axis icon ( ) and the Center on horizontal axis icon ( ). Add some text to the sides as you wish. When finished, group each box side with the objects on that side by first selecting the box side with all the objects inside and the using the Object → Group (Ctrl+G) command. When objects are placed in a Group, they can be manipulated as if they are just one object. This will ensure that when the box sides are transformed, the logo and text will be transformed as well. The sides after adding logo and text. Now the fun begins. We would like to distort each box side into a rhombus with the edges keeping the same length. This cannot be done directly. The distortions require several steps. The steps are to make the box sides narrower and then to skew them. The box top will also have to be rotated. When the sides are narrowed, we will want to keep the stroke width from narrowing at the same time. The option to scale stroke width when an object is scaled can be toggled on and off in the Tool Controls when the Select Tool is in use. Make sure the Scale Stroke Width icon is not highlighted (or if the icon is not shown because the window is too narrow, that the Scale stroke width box is not checked). If it is, toggle off the option. Select the box front (largest side). We want to be precise when we narrow the sides so we'll use the Object → Transform... (Shift+Ctrl+M) dialog. Bring up the dialog and select the Scale tab. Set the Width box to 86.603%. This is equal to cos(30°). Click on the Apply button. Use the Select Tool to drag the box front back against the other lower box side. It should snap into place. Next we need to skew the box front by 30°. This is easiest done with the Select Tool. Click on the box front a second time to change the scaling handles into rotating and skewing handles. When you do so, a small cross, the Rotation center, should appear in the center of the selection. This is the reference point for rotation or skewing. Click-drag this cross to the upper-right corner of the box front. Be careful that it doesn't snap to the corner of the bounding box. The cross should be centered in the middle of the Stroke. If it isn't, it will lead to small alignment problems at end. You can zoom in to check. Now click-drag the scaling handle (double headed vertical arrow) on the left side of the box front upward while holding down the Ctrl key. Using the Ctrl key will snap the skewing to multiples of 15°. Drag until the skew is −30° (watch the Notification Region). After transforming the front of the box into place. The front of the box may be in front (as shown) or behind the top of the box depending on the order in which you grouped the sides. The box top also needs to be narrowed by the same amount as the others, but this time in the vertical direction. Set the Width back to its default value and the Height to 86.603% before scaling the rectangle. Before skewing, move the Rotation center to the lower right corner of the box top. Again make sure the cross is in the middle of the stroke width, aligned with the grid. Skew the rectangle 30° by dragging the top skewing handle right while using the Ctrl key. Finally, rotate the box top 30° clockwise by dragging the upper-left rotation handle while holding the Ctrl key down. The finished box of playing cards. The box of playing cards is now finished. Save your work as in the previous tutorials. If you did not place the Rotation center exactly as specified (e.g., on the bounding box rather than the middle of the stroke), you may have a small misalignment in the box sides. One can either redo the steps or simply nudge the offending side into place using the Arrow keys while holding the Alt key down. The corner of the top of the box inside the red circle doesn't meet the other corner correctly. This was the result of aligning the Rotation center to the bounding box.